Welcome back readers today we are tackling some new cards From Gatecrash and today is an interesting casual card that I don’t see making waves in a competitive atmosphere. In standard the reality is if a creature does not have an immediate board impact its often left on the sidelines this creature relies on you having other creatures to make it effective another strike against it, currently this doesn’t provide something a lot of decks want but is a neat ability. In modern, legacy and vintage not a chance. In a slower block format this card could easily allow you to outclass your opponents in stalled board states and provides a decent evasive body. In casual angels are popular and making this a shoe in for some decks and providing relevant combat abilities on offense and defense seems extremely powerful when dealing with multiple opponents. In limited it’s a large flying creature that turns combat on its head for you providing a powerful and game changing effect. Overall a powerful card that I see making waves in multiplayer. Today's card of the day is Angelic Skirmisher which is a six mana 4/4 White with Flying that until end of turn gives creatures you control First Strike, Vigilance, or Lifelink at the beginning of each combat. This is a very flexible card that can make the most out of nearly any situation by granting the most beneficial ability available. First Strike against an evenly matched opponent, Lifelink against a clear field, and Vigilance when a counterattack would be more problematic than blocking. Overall this is a strong card, if a bit expensive, that will be a popular sight in Casual and Multiplayer that may also find a few decks in Constructed. This should be an impressive bomb in Limited by itself with the 4/4 evasive body also having whatever effect is needed each turn. There's no real drawback, even in the cost, and it is an easy first pick in Booster and solid foundation to work around in Sealed. Welcome to an exciting new week of card of the day reviews here at Pojo.com. This week we begin looking at Gatecrash cards. We begin with Angel Skirmisher, a rare white creature angel that costs four generic and two white mana. 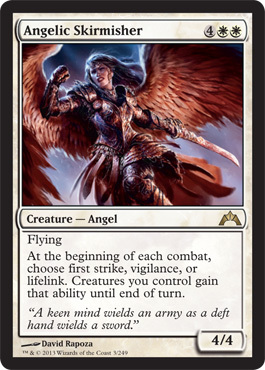 Angel Skirmisher is a 4/4 flier that says at the beginning of each comabt, choose first strike, vigilance, or lifelink. Creatures you control gain the chosen ability. Angel Skirmisher is just such a good card, I hope to see it get played a lot. The ability to give all of your creatures a choice of abilities on not only your turn, but your opponents turn is awesome. Choose vigilance on your turn and then swing, on your opponents turn choose first strike, and command the field. Just a really solid card. This card will be ridiculous in Sealed Deck where 6 mana isn't going to be too much of an issue. In draft it's a little less powerful, or I suspect so, but will still easily be gone by pick 3, if not a first pick. In constructed I just see it being too gimmicky and easy to kill for a 6 drop. I can think of plenty of other cards I'd rather this was for 6. I'm not sure if it was completely intentional, but this card looks remarkably like a card from the original Ravnica block: Concerted Effort, which I did try to play with back then but didn't spend as much time on as some other things. I actually think Angel Skirmisher is stronger, despite the fact that she costs 50% more, because of the ability to attack or to block. Also, the fact that her combat trigger ability helps you out on defense as well as attack makes her useful when you're behind and not just when you're even, which is not always a given with any card of any cost.